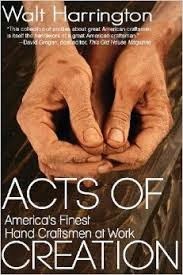 Acts of Creation by Walt Harrington was a cool book with the subtitle "America's Finest Hand Craftsmen at Work." The short work was published by the Sager Group and in the prologue, Harrington noted having spent two years working on it and how he never personally was a hand craftsman, but could happily "fiddle all day with five pages of writing." The contents was made up of 14 different profiles of craftsmen and while a few of the subjects had become wealthy, most hadn't, and themes across the profiles include: a care for craft, the idea of human decency, and a higher purpose to the work, such as in teaching others to create. Each subject has 8-10 pages written about them and their work and if someone wanted to go deeper on a subject, there's additional material to read out there, such as on woodworker Sam Maloof, someone who won a MacArthur Foundation "genius" grant and house and workshop in Alta Loma, CA (Los Angeles area, by the San Gabriel Mountains) are on the National Register of Historic Places. Bob Dix - locks... chapter included mention of Dix thinking on locks to figure out how they worked. Manuel Palos - stone carvings & cement castings... SF based, built a dragon fireplace for Nicolas Cage.